The third film in the satisfying Ginger Snaps trilogy is the least successful, but still stands heads and tails above most contemporary werewolf yarns. An attempt to piece together, define, and finally explain the Fitzgerald sister's mythology, Ginger Snaps Back repeats too many elements of its predecessors and travels in too many narrative directions, but still retains a majority of the dependable acting, suspense, and stunning visuals of the franchise. Ginger Snaps Back throws Ginger and Brigitte Fitzgerald into a nineteenth century setting with little preliminary explanation or reasoning. It's a transition that some fans may find jarring, to say the least. The film begins with the sisters traveling the pioneer countryside by horseback. When they suddenly find themselves stranded in the woods, they are rescued by a Native American hunter. Brigitte and Ginger soon find themselves the unwanted guests at a mostly abandoned fort in the middle of the woods. One guess as to what's happened to a majority of the fort's previous inhabitants. 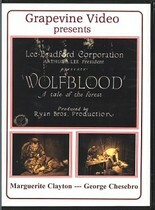 Werewolf films are well-suited to period-piece drama because, like vampire films, they carry the weight of long-standing mythologies and lore. Ginger Snaps Back, in its setting, is quite successful. The production design by Todd Cherniawsky is absolutely stunning, with snow banks and festering wooden gates providing a sense of claustrophobic dread that is missing in the previous Ginger films. Visually, the film spanks its predecessors. The plot, unfortunately, is a muddled rehash of the original film's story. Ginger is bitten, and Brigitte must defend her sister, attempt to find a cure, and hide her sister's ailment from the suspicious pioneers. Ginger becomes hard to handle, and her sister is forced to make choices that may destroy them both. Basically, it's the same old story, dressed up in fancy clothes. The acting by leads Katherine Isabelle and Emily Perkins is first rate, as it has been throughout this engrossing series. Unfortunately, the supporting cast is weak and uninspired. There's a sweet-natured sheriff willing to stick his neck out for the sisters, an overbearing preacher hell-bent on proving the girls are against God and nature, a hard-boiled military-type, and a weak, spooked youngster. The only exciting new character is the Hunter, the Native American who saves the Fitzgerald sisters from death in the woods. He provides the film with a much-needed does of mystery and suspense. He unravels the sister's legacy and sacrifices a great number of things in order to educate Brigitte and Ginger about their destiny. Destiny is a thread that runs rampant throughout each of the Ginger Snaps films and is all the more prevalent in this entry. In fact, the definition of destiny is the main reason behind this film's setting. But destiny has also raised questions throughout the series that are finally answered here: Why are Brigitte and Ginger cursed by the lycanthrope? Do the sisters control this curse? What is the role of their ancestors in their modern-day fate? The film's mysteries are interesting, but are also convoluted by subplots that run rampant and take up too much of the film's running time. 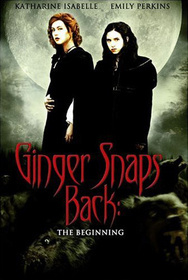 Whereas the previous films focused on the deadly and harrowing transformation from human to werewolf, mixing traditional lore and modern mythology as metaphor for adolescence and its repercussions, Ginger Snaps Back relies too heavily on its plot, for the most part leaving the character development behind. The film is so concerned with tying up loose ends that the Fitzgerald sisters almost seem like bystanders. At least until the last act of the film, at which point they finally become the proactive, spunky sisters we've come to know. My only complaint about their characterizations: the dialogue. Brigitte and Ginger spend most of the film speaking as though they are in the 21st century, not in the old west. Dialogue that was once realistic and refreshing now seems out of place. It's an unfortunately noticeable flaw. Ginger Snaps Back was filmed back-to-back with Ginger Snaps 2, and therefore benefits from that film's outstanding creature design. The wolves in this film--and there are a *lot* of them--are menacing, hairy creations of the highest order. Ginger Snaps Back and Ginger Snaps 2 contain the best wolf designs I've yet to see in a werewolf film. And that's saying a lot. Although not as fulfilling as the previous entries, fans of the first Ginger Snaps will probably find this film, at its most basic levels, a bit more digestible than Ginger Snaps 2. It features a quicker pace and more fantastic gore than the second film, as well as an interesting setting. It also provides Ginger aficionados with a lot of the answers they've been searching for. And, even though it's not completely successful, Ginger Snaps Back manages to be an asset to the series, not a drain. But, as far as more sequels are concerned, let's hope this is the last full moon for Ginger and Brigitte. The series exists as a nearly flawless trilogy into which werewolf fans can really sink their teeth. It'd be a shame to let the flaws of Ginger Snaps Back become the standard as opposed to the exception.